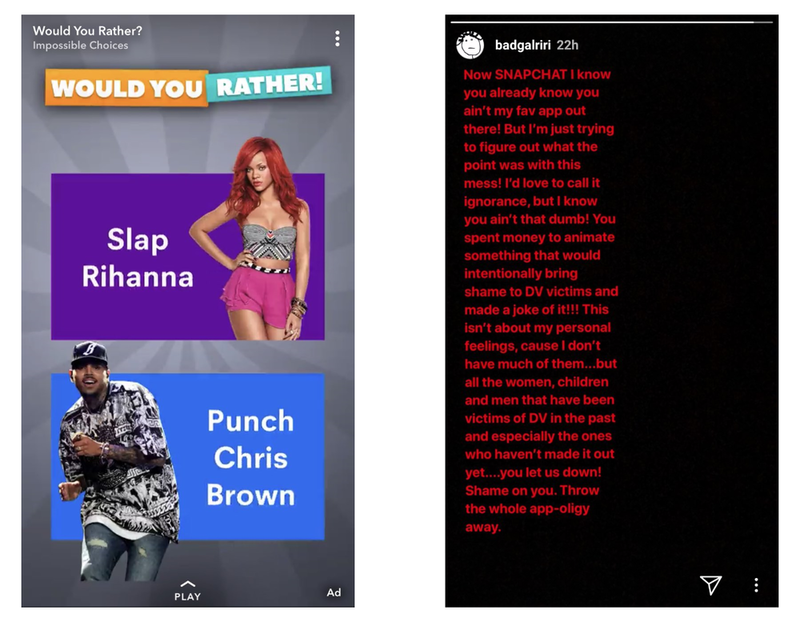 Rihanna Called Snapchat Out For A Domestic Abuse Ad. Now Their Stock Is Dropping. Snapchat stocks dropped by nearly 5% on Thursday after Rihanna responded to their ad that made light of domestic violence, by referencing to her 2009 incident with Chris Brown who physically assaulted her. This didn’t stop Rihanna from critiquing the company’s judgment; on Thursday morning, she went on her Instagram story, where she offered her thoughts on the snapchat post in red writing. The net worth of the company's CEO fell nearly $150 million over two days, the media reported. But this is not the first time that Snap — whose market value has dropped 25%, to $20.82 billion after celebrity criticism. Last month, Kylie Jenner tweeted that she no longer used the app following a redesign, causing Snap's share price to fall more than 6% and the company to lose $1.3 billion in market value the power of a WOMAN. Snap chat did put out a statement about the ad, Snap said. Are you all still using snapchat? How do we feel about this ad? What Key Things You Should Look For In A Sexual Partner?